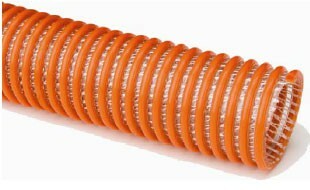 Flexible PVC, clear, with an orange rigid PVC helix. Reinforced with a layer of spiral yarn. Specially designed for suction or transfer applications where visual flow or pressure is required. Temperature range -15 Deg F to 150 Deg F.